The nuances of bass fishing never cease to amaze me. I’m captivated by how changes in baits, tackle and application can come together and create an effective fish-catching system. Angling truly is greater than the sum of its parts. Few techniques have benefited from this process more than frog fishing. The days of dragging a lifeless, hollow, rubber frog around a patch of lily pads are long gone. Now, there are two very sophisticated schools of thought on how to use specially engineered baits to catch big bass. One side is more traditional; they look at frogs as “slop baits” to be fished around, over and through heavy vegetation. The other side (most notably Elite Series Pro Dean Rojas) look at frogs as “weedless topwaters”. 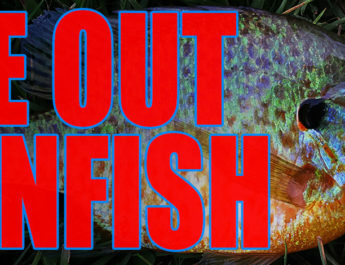 In my experience many anglers confuse these two applications, and it is costing them fish. Knowing how to separate these two techniques and the equipment you need to make them work is crucial to success. Healthy aquatic vegetation holds an abundance of life. Spend some time in a bay of lily pads, stop and watch the surface slop in a backwater, or watch closely as you drift past rows of cattails, and you’ll see the entire food chain come alive. Insects buzz along the waters surface, minnows and panfish cruise below, frogs and turtles sit motionless soaking up the summers’ warmth. Amidst all of this tranquility, big largemouth lie in wait for their next meal. Creek mouths, pad fields and slop bays can be vast and intimidating. The thicker the vegetation, the fewer options you have to get baits to the fish. This is what the frog was born for. Heavy tackle, long casts, a strong work ethic, and lots of patience are required to make the most out of these aquatic jungles. in the largest size. Both of these frogs come through the slop and hook fish well. The Bobby’s Perfect has a great rattle chamber that emits enough noise to help bass find the bait through the mat. The Koppers frog is heavier and sits a bit lower, which also helps fish find it. 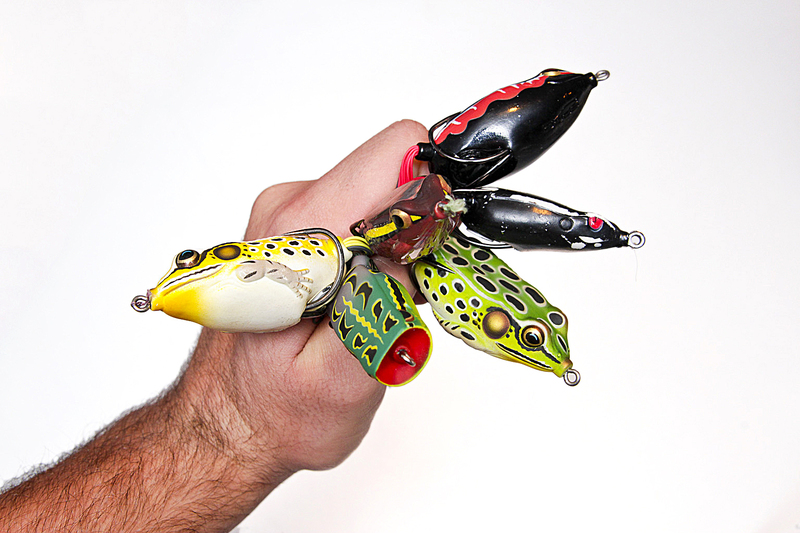 I always bend the hooks out slightly and add a small rattle to the Koppers frog. Rod selection is the next consideration. A good frog rod is necessary both for the long, accurate casts required to reach the fish, and to set the hook and drag them out of hiding. You don`t need to spend a fortune, but a rod that is too weak, too stiff, or too short will just make things harder than they already are. I use a G.Loomis TWFR935C. This 7’9 extra heavy action rod was designed specifically for fishing frogs over matted vegetation. Don`t let the extra heavy action fool you, this rod has a soft tip that allows me to launch Kermit across the mat with accuracy. Stiffer rods may hook fish just as well, but if you can`t cast them then you will just get frustrated. shines. You will rarely be fishing the frog all the way back to the boat, so burning in the last few yards of line will allow you to make more casts in a day. Also, when a big fish hits at the end of a long cast, you need to wind up the slack quickly to drive those hooks home. Line selection here should be obvious; heavy braid all the way. I’ve had great success with 65lb Power Pro. 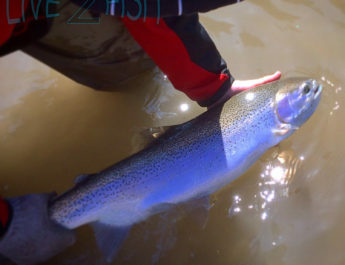 Some anglers go as heavy as 80lb test. Choose what you have confidence in, but do not use less than 65lb. The thinner diameter braids dig deep into the spool when setting the hook, and just don’t have the abrasion resistance of the heavier lines. Once you have all of the appropriate tackle, putting it to use is all that is left. Make a long cast across the mat. Once the frog lands just pick up the slack and wait. Now raise your rod tip to ten o’clock, and slowly start working the frog back to you a few feet at a time. If you know the fish are active or if you are searching new area, you can bring the frog back with short pauses. If you know you’re on fish that won’t bite, try twitching and dead sticking the frog to tempt them into it. Lastly, keep a throwback bait on deck to try and convert any fish that miss the frog. A jig, punch rig, or weightless plastic are all good options. Fishing mats with the frog takes patience and persistence. Combine these with the right equipment and you’ll be targeting big bass that many anglers overlook. What started as a slop bait eventually transformed into a unique and innovative approach to fishing shoreline cover. Elite Series Pro Dean Rojas has successfully used frogs to cash big cheques by skipping them under docks and lay down trees. It took me a while to experiment with this technique, but once I got set up with the right tackle I quickly learned why Rojas had been so successful with it. The system starts with the bait itself. Rojas designed frogs for Spro that were compact and streamlined. The bodies are slightly denser than other frogs, and they have a sleek, smooth construction. These qualities all make the baits skip exceptionally well. Both the original Spro Bronzeye 65 and the Bronzeye Popper skip easily with a snappy side arm cast. It may take some practice, but it’s worth the effort. Both of these frogs walk easily like a Zara Spook. The popper pushes more water if a louder bait is desired. I like to open the hooks just slightly on each of these baits. The rod for this technique is very different than the one used for slop fishing. I use a 6’10 medium heavy Shimano Compre that is no longer in production. Many similar rods will work, but the key is an extra fast tip. If the rod has a tip that is too soft you will not be able to generate enough energy to skip the frog accurately. Rojas has designed a rod for this purpose for Quantum, but I have yet to use one myself. The best reel for this job is one that is the exact same as for slop fishing; a high speed 7:1 ratio. The strike zone with this technique is small. You will only be working the frog for 10-15’ max before burning it back to the boat. A high speed reel also allows you to pick up slack as the fish rushes from shore and into deeper water once its hooked. Line choice is also the same; 65lb braid. 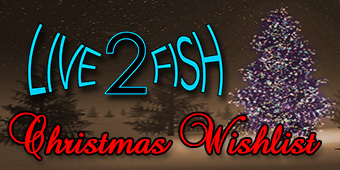 This allows you to horse fish from the impossible places without fear of breaking them off. Once you’ve got the hang of skipping frogs under docks and trees, it can be a very efficient way to fish. Just cruise down the shoreline and pick apart your targets. In the longer stretches without obvious cover, just parallel the bank and walk the frog in open water. As always, having a throw-back bait is vital to pick up any fish you miss. A jig or weightless senko are two great baits to have at the ready. Hollow bodied frogs represent natural forage in the form of not only frogs, but mice, birds and panfish as well. Many angles fail to look past the obvious when it comes to bait selection. Why represent only one food source to the bass when you can represent several? 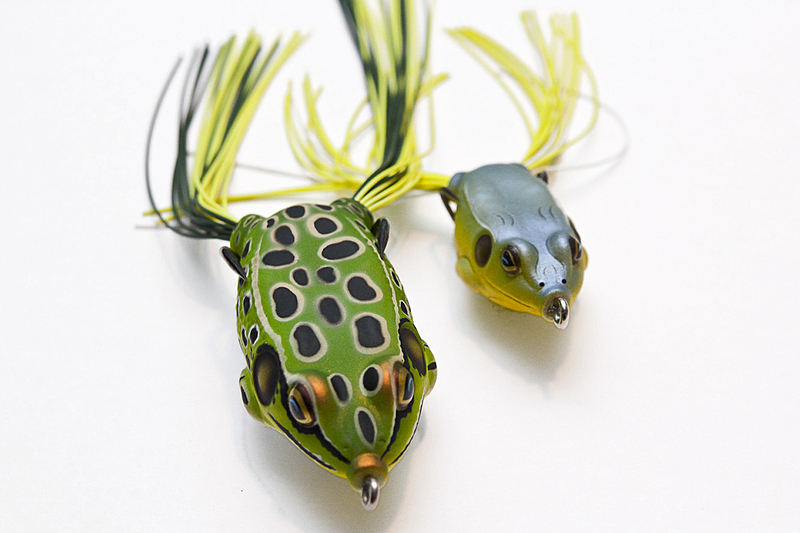 Much like a jig, this versatility is part of what makes a frog such a great big fish bait. There are great looking patterns available in frogs today. You don’t need to buy all of them, but you should have some variety for each situation. For slop fishing, the bass can’t see the frog so much as they can hear and feel it. In this case you may want to choose frogs that are easier for you to see as you retrieve them. Colour can be a bit more important when working down the bank. In this case I try to “match the hatch”, since I’m usually trying to imitate baitfish as opposed to an actual frog.